Welcome to Jim's VICTORY website! This website is devoted to research on creating a SIMPLE variant for VICTORY by Columbia Games. I plan to post my ideas, invite response, and post the results of playtests by interested players. I am going to assume that visitors to this site will already be familiar with the game. 1) Attacks usually are very costly, and generally fail. 2) The only thing that REALLY matters in the game are cities. Therefore, players generally pack their cities full of units as quickly as possible, especially the vulnerable ones closest to the enemy. There will usually be a small battle here or there for a town (non-PP city) but generally the brunt of the action occurs in suicidal waves of attacks upon one or two cities. The CV values that will be expended to take a city are generally on the order of 15-25 times its production value. That being the case, there is not a strategic reason to take a city - it will not affect your production THAT much to compensate for the loss unless you play the game out for 15-25 more turns. This could take upwards of 6 hours! Thus, after a few games, players realize that a static defense "plays" the best, and the game gets BORING. You wait for your opponent to attack, and then capitalize on his or her inevitable losses. Some players (and Columbia as well) have countered by constructing scenarios that drive the game, forcing players to do a certain thing in a limited number of turns. This is one way to solve the stalemate, but it does add an outside influence on the game. Furthermore, it places an artificial limit on the "war", making the last turn a kind of "free for all." One way to counter this is to construct a table where the game may end on a certain turn given a roll of 1 on a d6. Then on the second possible turn, the game will end on a 1-2 on a d6. This keeps going until the sixth turn when the game "really" ends, 1-6 on a d6. It's one solution to the "end of the world scramble" but I prefer to have the game end when I say it ends . 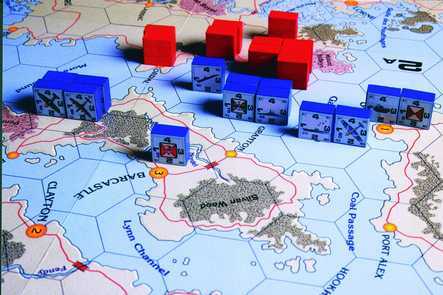 . .
Other players have tinkered with the units themselves - constructing elaborate matrices where certain units attack or defend at different levels, etc. These players are trying to inject a sense of realism into the game, looking at what certain units REALLY did and integrating that into the game system. While that might make certain units behave more "realistically", it adds another level of complexity to the game, and doesn't address the fundamental "stalemate" syndrome. Before I talk about my suggested rule changes, I want to tell you about my general philosophy toward VICTORY and games in general. I think the key thing that many players fail to see is that at their essence, these are GAMES. I'll repeat this - GAMES. They are supposed to be fun. While that doesn't mean that a certain amount of historical realism isn't necessary, the key thing to remember is that most of us are doing this for fun. Some players find incredibly complicated games fun, I don't. I might have 10 years ago when I was in college, but now I'm lucky if I get 3-4 hours of free time maybe two or three times a month. VICTORY as it stands is relatively simple. What I would like to do is introduce a variant that allows VICTORY to remain simple, yet improves its playability. If you are one of the people that want to make the game all complicated, then this is not for you. I want something SIMPLE that will turn VICTORY in the A&A type game that is was supposedly supposed to be. #1. Reduce stacking limits in cities and towns to two (2) ground units. Naval and Air stacking are unchanged (2 each). From a logical standpoint, this DOES make sense (other than that since these are 60KM hexes, in theory you should be able to put a virtually unlimited amount of units in a city) - if a forest limits stacking, why wouldn't a city? From a play standpoint, this will limit the size of the "target objectives", and make rule #2 even more effective in changing the makeup of the game. #2. Attacks by ground units are limited ONLY by existing hex-side restrictions. Attacks are resolved as before, if attack is successful, the winner must observe the stacking restrictions and leave excess units in the hex from which they came. What this does is give attackers the ability to create 2-1 or 3-1 attack/defense ratios, something that most of us are familiar with in other games. While defenders are limited by stacking restrictions, attacker can put as many ground units into the hex as the hex-side restrictions will allow. Theoretically, this could mean that 12 ground units attack a city, let alone the air and naval (which remain at 2, as above). Realistically, the hexside restrictions as well as the way the game works, you will be lucky to get 5 or 6 ground units in there along with the air and naval. See link to discussion with Brion Emde here or below for further clarifications. As it currently stands, VICTORY is a game which creates a series of 1-1 attacks. Anyone who has played even a simple game like RISK knows what happens in a 1-1 attack - both sides take losses, and generally the defender has the advantage (as he should, realistically). In a small percentage of the cases, they succeed. Again, this modification changes things so that attacks are encouraged because they succeed a greater percentage of the time. #3. Cities which are cut off from the "road net" and/or blockaded by naval units may only support 1xPP units. All other units in that city lose 1 strength point per turn that they are cut off. This occurs at the beginning of the player's turn. Units that cut supply do NOT need to be in supply, however they do suffer supply attrition as usual. This encourages players to guard their supply lines, and in conjunction with rule #2, not concentrate all their forces in a city. Besides guarding the roads, outlying units also eliminate hexsides as avenues of attack, helping to reduce the possibility of a strong attack. See one player's comment on this aspect of the suggested rules here or click on the link in the updates below. I personally think the best production rule is that NEW units cost 2PP and that units may only be built up one strength point per turn. Regardless what players may think of the realism of building a battleship in four months, I think that this rule strikes a good balance between realism and playability. Realistically, PEOPLE take a lot longer to make than one month too. I also think that the friendly AA as it stands is a little drastic. I have heard from other players that the air power unbalanced the game, and I think that friendly AA could be one reason. I like to play where players need to roll 2 "friendly hits" before one of their planes is reduced. This increases the willingness of players to shoot back at the planes that are attacking them instead of not shooting because they are afraid of hitting their own planes. I'm looking for people to playtest this minor rule change and give me their feedback. I've been invited to submit an article regarding these changes and comments on VICTORY in general to a gaming magazine and would love to be able to include any of your thoughts and quotes on the matter. If this doesn't work, I'd like to have some solid data behind why it doesn't. NOT - "I don't like the way it looks" but more along the lines of "We played this way twice and here's what happened." All I ask is that you play with the above three rules and tell me how it turned out. Use one of the easier scenarios in the rules, like each player gets a map and 20 full strength units or each player gets a certain number of strength points to allocate as he or she sees fit. But remember, I'm trying to keep it simple, so let's start with an easy scenario and see how it works. Play with any production rule you like (but be sure to tell me what it was), and keep the other house rules and tweaks (friendly AA rules, whatever) to a minimum. Let's Keep it SIMPLE ! ! ! Check out how I used units from Victory to add a more military flavor to the all time classic "Settlers of Catan." Here you can learn more about my medieval coin collection. Here you can learn more about some of my other gaming interests. Go direct to the source - check out their Forum for lots more Victory discussion.